Like any aspect of preparedness, safe rooms are only as good as the planning and products that go into them. Cut corners, and they may fail you when you need them most. Build your room to address the seismic, weather and other potential hazards you are likely to face in your area. Look at every aspect of the room, including the entrance – a weak door is a fail point. A strong door in a weak frame is a fail point. 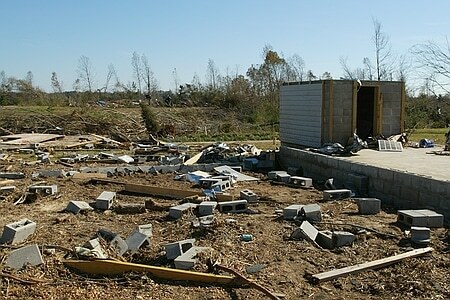 I think most of us have seen tornado and hurricane debris driven through tree trunks and appliances – a standard lightweight door is not going to cut it. Make sure the door opens in, not out, in case debris blocks the exit. Proper crossbracing/reinforcement in the walls and ceiling is essential. A safe room that collapses under load (winds, building collapse, etc) is nothing more than a death trap. Do some research before you build – don’t be that guy who just starts digging a hole in the backyard, only to run into a high water table or unstable earth. Don’t think you can just bury any old container in the yard and call it good. Soil is heavy, and wet soil is even heavier. Whether your safe room is at or below ground level, make sure it is securely tied in to a foundation. You don’t want to have a projectile proof walls and door only to have the entire structure tear loose. Make sure you have a source of fresh air. My entire home is made from insulated concrete forms (ICFs), a popular choice for safe rooms, and I can guarantee that it gets a little stuffy inside when the doors and windows are closed. Now imagine – small room, several people, possibly pets, emergency supplies, panicked breathing – and no fresh air. You get the picture. What Supplies Do You Want to Store With You? Think about who and what is going to be in that room. Will you have enough room for your entire family? Will others be allowed inside? What about pets? Which critical supplies stay in the room, which are placed nearby in hopes that you will be able to reach them if needed? Water, food, blankets, lighting, communication, medicine, valuables, ammo, some items for the kids – where are your priorities? My husband is ex-military, and he likes to site the “7 Ps” – “Proper Prior Planning Prevents Piss Poor Performance”. Know your risks, plan appropriately, and stay safe when it counts. This post is based on an excerpt that I wrote for the book “Preppers Home Defense“. Note: Safe rooms can be built during initial construction, or they can be retrofitted into or attached to existing homes. Mysaferoom.org provides some estimates of safe room costs for different materials, and notes that retrofitting a safe room in an existing home will be roughly 20% more expensive than building new. For an 8'x8'x8′ room, their prices range from $7000-$8300. Here in North Carolina, most houses don’t have basements. After looking at that photo from the Alabama tornado, I’m thinking a safe room would be the next best thing. Thanks for the link-up. I enjoy reading what others are up to.